Wolfsbane was one of the sequels coming out this year that I was looking forward to the most having loved the first book but I'm sorry to say it didn't quite meet with my expectations. I probably should have reread the first book again before starting on this book but I really didn't have the time to do so. This meant that I spent the first 50 - 100 pages playing catch up trying to work out who everyone was and what had been happening in the previous book. You really do just get thrown back in at the deep end with it. The first chunk of the book I found to be quite slow. It's all finding out more background to the wolves and the the mythology behind the packs and planning for the next attack. There was also a complete lack of Ren for the majority of the book which i didn't like as I loved him as a character in the first book. I really did find myself losing interest at this point and was close to giving up on the series entirely and had I not completely loved the first book I probably would have. That said there were bits of this book that I did love. I loved Shay and Calla together (or not as the case may be) and the tension built up between them was awesome. When the action does kick off it is awesome and I loved seeing the wolves back in action once they got going. The end of the book was awesome and I am once again left on a cliff hanger dying to know what happens next. All in all I would argue that this book suffered from "middle-book-in-a-seriesness". I am still desperate to find out how the whole series goes but I was left at times a bit bored waiting for something to happen. My advice - read them back to back to keep all the various elements fresh in your head so that you enjoy it more. This reminds me that I was kind of disappointed by Supernaturally after loving Paranormalcy by Kiersten White. 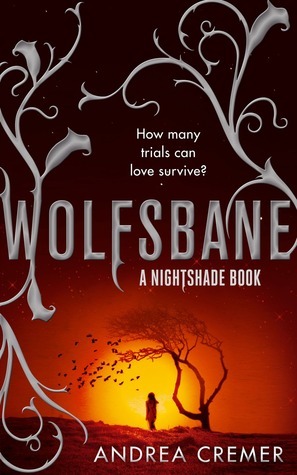 However I am in the middle of Nightshade right now which means that I will be able to dive right into Wolfsbane and hopefully that will help me enjoy it more. I stopped reading your review after you said you were disappointed! Oh no! I really hate when that happens. I only just read Nightshade a month ago, so I'm still really excited to read this one.